Three Royal Navy war ships may sail to Europe to pick up stranded travellers after flights were grounded because of the volcanic ash cloud. 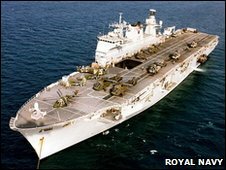 Portsmouth-based flag ship HMS Ark Royal, as well as Devonport-based HMS Ocean and HMS Albion, could be sent to Spain and other Channel ports. HMS Albion is already en route to Santander in Spain to pick up soldiers. HMS Ark Royal, off Scotland, is sailing south. HMS Ocean is standing by, the Ministry of Defence (MoD) said. If deployed, the ships will collect people whose flights have been cancelled. On Monday, flight restrictions were extended by air traffic control service Nats to 0700 BST Tuesday. HMS Ark Royal, which was deployed on exercise off the north-west coast of Scotland, is sailing south to provide further assistance as required. Commando helicopter carrier HMS Ocean, the navy's biggest ship, left Devonport Naval Base in Plymouth on Monday morning on a routine training exercise. It is in southern British waters but is now standing by for tasking, the MoD said. HMS Albion, an amphibious landing ship, was already on its way to Santander to pick up more than 200 soldiers from 3rd Battalion The Rifles. The troops were returning home after a six-month deployment in Afghanistan. It is expected to reach Santander on Tuesday morning. The MoD said it was looking at how a number of navy vessels could provide support to government efforts to assist British travellers stranded abroad and wishing to return home to the UK. It said: "We are urgently looking into the detail of how this support will work in practice; but, as part of the preparations, we are looking at how the RN will be employed to provide assistance to the government's wider efforts."